your opponent on new maps and coordinate more easily with teammates using the Map Ping feature. For a list of all the changes, check out the changelog below! Unit Responsiveness - Units now respond faster to move orders and reach their destination more efficiently. 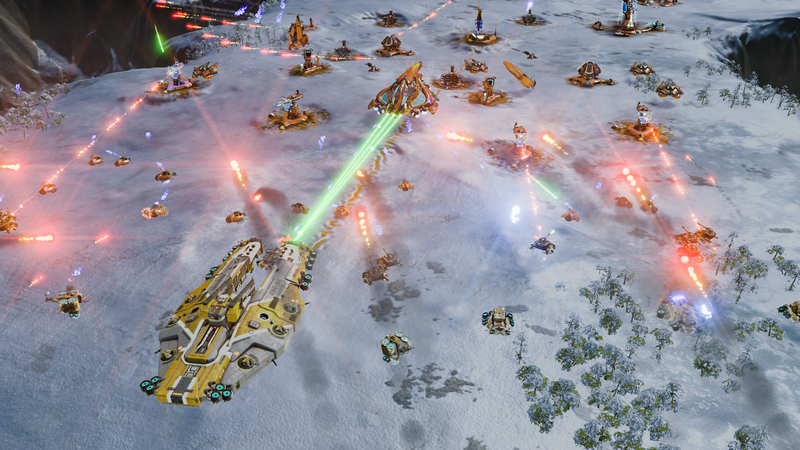 Adjusted acceleration and banking speed makes units more responsive to your input, which allows for greater control of your armies. 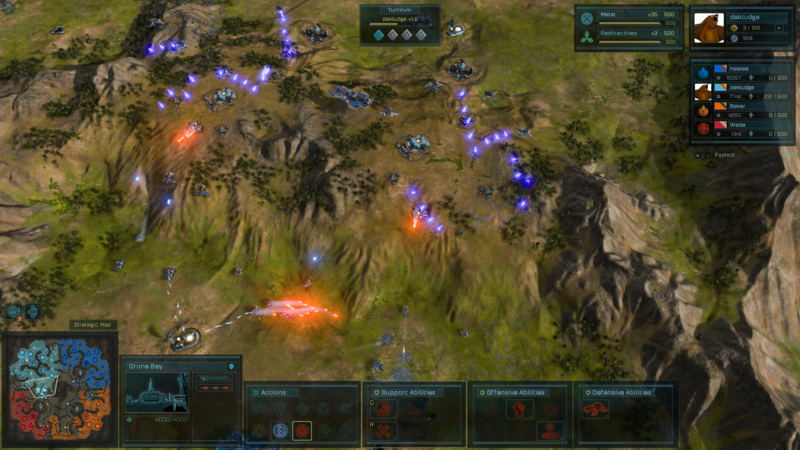 Upgraded Movement - Larger units are now upgraded with improved movement and physics. 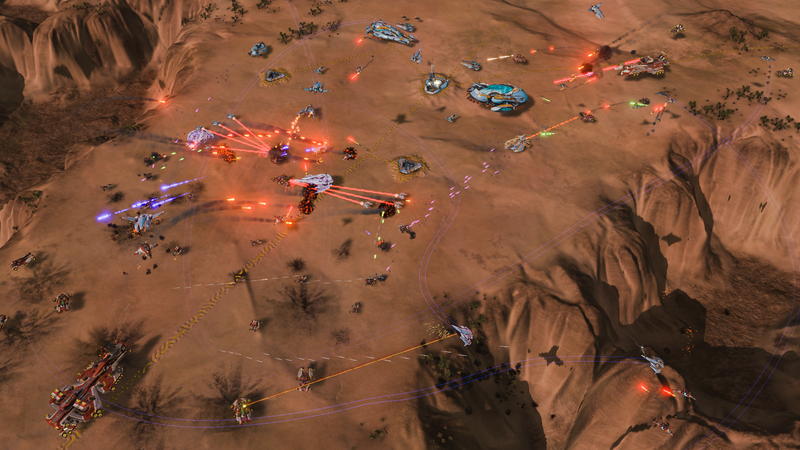 The new AI tweaks will prevent them from clumping up (and becoming sitting ducks) or for jockeying with each other for position instead of fighting the enemy. Map Ping - You can now coordinate attacks with your teammates by placing a marker on the mini-map. Visible only to members of your team, this feature will allow you to group up before your big assault. Maurn - Charge across the central bridge toward the enemy base, or gun for the victory points around their flanks in this small, two-player map. Monaco - Two bridges: a short route to the north, and a longer (but resource rich) route to the south. Choose your path wisely in this small two-player map. Urich - A wide-open desert with long routes to the enemy base encourages massive clashes between opponents on this medium sized two-player map. Pulaski - Small but rich pockets of resources dot the winding canyons on this medium sized four-player map. Tortuga - The central valley holds victory points and most of the riches, but enemy bases stand in the way on the edges of this small, four-player map. We have added map ping to the game. So you can ping a location on the map that only your teammates can see. You can now see if there are any available multiplayer games from the main menu. Units are much more responsive to commands. 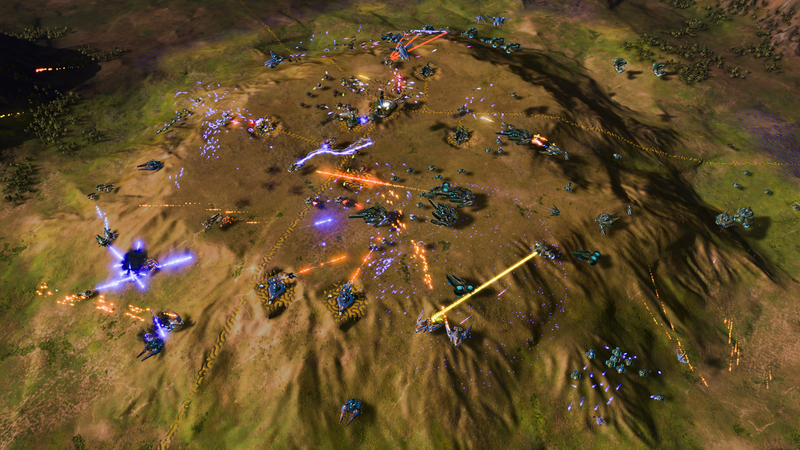 Improved T3 movement and physics that prevents them from clumping up and/or fighting each other for ideal firing position. 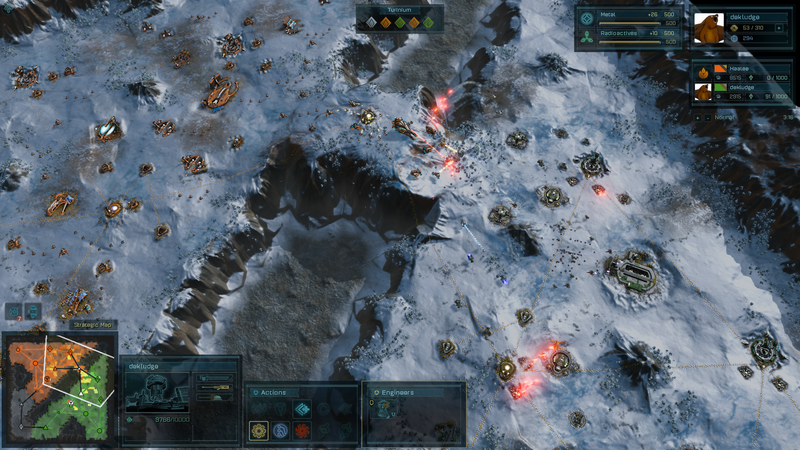 Explosion/impacts now appear closer to the unit's surface. Urich - This wide-open desert with long routes to the enemy base encourages massive clashes between skilled opponents on a medium, two-player map. Tortuga - The central valley holds all the victory points and most of the riches, but short paths along the edge lead to enemy bases in this small four-player map. Pulaski - Small but rich pockets of resources dot the winding canyons of this medium, four-player map. Monaco - Two bridges: a short route to the north, and a resource-rich but longer path to the south. Which way to victory in this tiny two-player arena? Fixed an issue that was keeping the panel labels from showing up on the orbital display. Dreadnoughts won't clip through each other anymore. Quantum Health Upgrade now applies to queued units. Fixed a rare host migration issue (ie: failure when the person hosting the game leaves and another player needs to become the new host). Fixed a Memory leak in async GPU code. Fixing a bug where a host could get themselves into an MP game by themselves by changing the lone user or AI they are playing against to an open, closed, or observer slot at the end of the game start countdown. The game will no longer crash on startup if the audio device is missing or disabled. Updated the audio mix to prevent battle sounds from overwhelming the music. Give me that defense thing! does anyone know a solution for the DX12 panning bug? Can either of you elaborate on 'DX12 panning bug'. Perhaps add some video of it happening; at least more detail of the issue and how to reproduce. Daft question but i cannot for the life of me find where to download the v1.3 patch. I see links stating it's available yet i cannot seem to find the download itself. 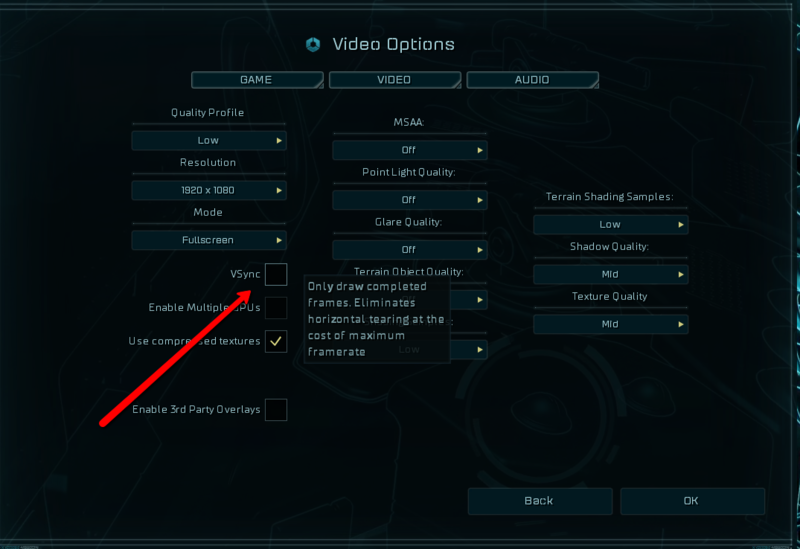 On Steam it will download automatically unless you have set settings which stop it doing so. If it is still running v1.24 then you could try a reboot of Steam or check for queued game updates in the download section of Steam. If you are on GOG they tend to be a bit behind Steam when it comes to forwarding on patches. Glad to hear it... Let us know if you need anything else. Thanks for the reply Ticktoc, had a look at the file version in the game folder and it says its 1.3. Steam must have updated it in the background without informing me. I hope turning off v-sync is considered a very temporary workaround, people have v-sync on for a reason. +1. it is OK for a temp fix, but that is about it. The primary being to eliminate tearing. Are (any of) you seeing that with it off? Someone on the forums complained of tearing after turning it off. Also having v-sync on is pretty normal for many gamers, do you want more people on the forums complaining about the bug or more negative reviews, which often complain about bugs, on Steam? Your response isn't what I'd expected. WHERE'S THE UPDATE DOWNLOADED FROM? My apologies,Ticktoc; I will attempt to be more clear. Yes, it will be looked at. My reason for wondering if people were seeing tearing with it off is to see if the workaround was indeed worse than the actual reported issue. The number of people that would have to use it at all, however, should be nominal - we have only seen the 'jitter' in very rare instances and not always consistently among them. But again, yes, it will be looked into. If you have the game on Steam, you update from there. If you have the game on GOG, the update should be released there soon. Thanks for your reply. Sorry if my own came across a bit short. Some bugs seem to exist for a long time which is a bit frustrating so I guess I was looking for more of a strong affirmative response. My current most hated long living bug is that when you want to launch orbitals that menu can suddenly disappear, repeatedly. It is frustrating and can cause you to miss the opportunity to use the orbital in that situation. Someone thought it likely that it was when the unit or the unit that is the head of an army selected at the time dies. They could well be right I think. That shouldn't happen, and really the orbital menu should be selectable without having to have any units selected. I'm hoping this will be addressed in v1.5/the expansion with the UI overhaul. Thoroughly unsatisfying 1v1 ranked map pool. . . like the only purpose of everyone's writing on the forums criticizing maps was ignored. Same old unbalanced maps. Bad. Are all the maps really the same as last season?! The one's I've done are the same and someone in the game chat said they were all the same...I am really surprised by that. Frogboy said the new season would have new and very different maps. I kinda expect that to happen at the beginning of the season, keep things fresh. Same maps pretty demotivating tbh. Keep a few of the better season 1 maps if you like, or the ones added half way through last season, but 70% needs to be new. Two things really stand out due to lack of them in Game. #1. the full Zoom in and out. Too easy to lose units on maps, need the full mouse wheel zooms. #2 The army system doesnt like multiple dreads. Just isnt well behaved once you add a second dread..
Over all really like the game. Those two things are my problems. And they really show up on big maps, your small maps are everyone elses large.. really screams for full wheel zoom ( zooms out to encompass full map ). Will be buying the EXP just for the zoom if nothing else..
Good work, and gratz the game is doing better than expected.. Always helps longevity..
Good news it's done now.